Super Hero Boy: Fireman Sam - To the Rescue!! Fireman Sam - To the Rescue!! Fireman Sam is totally new to us over here. Fireman Sam airs on TV on the PBS Kids Sprout network and sadly our cable provider does not have Sprout as much as I complain about it on a regular basis, no luck yet. Thats ok because Fireman Sam : To The Rescue is now available on DVD through Hit Entertainment, the same ones that bring us Bob the Builder. You know ironically Fireman Sam does remind me a bit of Bob but with a European twist. Fireman Sam is near and dear to our heart over here as Connor's dad is in school to be policeman, so public service is a big topic of discussion around here. Actually not to get up on my soap box but its one thing that you see lacking in a lot of children's programming. Though Bob really gets the message of teamwork across, helping your fellow man when sometimes you may be in danger yourself is not always a hot topic. Fireman Sam brings it to children in a way that is non intrusive, funny, and really entertaining. Plus its really a role model children can look up to. Included on the DVD is five episodes of Fireman Sam to get you started. If your lucky enough to have the Sprout channel you can check him out there as well. 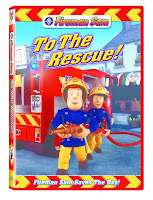 Fireman Sam : To The Rescue is available right now on Amazon! Hit Entertainment has given us FIVE copies of Fireman Sam : To The Rescue to give away to our readers! Leave a comment on this post. Check out Fireman Sam : To The Rescue and Hit Entertainment and tell me which character from the Hit Entertainment DVDS is our favorite and why! This contest will end July 16th at midnight! I really have always loved Red from Fraggle Rock thanks to her energy. We are also big Pingu fans here. The question is "tell me which character from the Hit Entertainment DVDS is our favorite and why!" I guess since you talk so much about Bob the Builder, he is your favorite. Was there some other clue I missed? As for my family's: Well, Penguins have been my favorite for years...so I love Pingu. My kids love Thomas and like many others. Blessings to you and thank you for the opportunity! I'm not sure I know why, but from Fireman Sam, Elvis is my favorite character. From Bob the Builder I like Scoop. Thanks for the contest. My 3 year old saw that I was entering this one and got very excited. I watched the little video on fireman sam. I thought that it was really cute. I also thought the little boy that had his head stuck in the fence was funny. I would love my 2 year old dd to watch this show. I think that it would be great for her to understand what a fireman is and how he helps our community. At the 4th parade she was terrified of the firemen. I also played the little games on the website, they were really cute! I would have to say Barney. He is just so kid friendly and always a favorite of children. Love your site, and have never been first to comment! Our favorite is Bob the Builder because of his friendly personality and he works with trucks, which the boys love. Fireman Sam is great too. The fire truck is my favorite because my little grandson gets all excited when he watches it and he starts running around the room like he is one. My favorite Firesam character has got to be Norman. He reminds me of my son Benjamin who although is not a ginger-haired boy, shares Norman adventure for life. My favorite character is Bob the Builder. Mainly, because he is my son's favorite, but I've found myself stopping what I was doing to watch an episode or two! lol. Fireman Sam is my favorite because he is the home town hero. The favorite Hit Entertainment character around our house is Bob The Builder. They can't seem to get enough. I just asked the question why and the answer that I got was...."because, I like him.". So, from the mouth of babes there you have it. Fraggle Rock. It came out when I was first a kid, so now we like to share it together. Especially Mookie. Bob The Builder is my favorite. I'm not sure who is your favorite as the question asks but my son loves this show and his favorite is Sam...he loves firetrucks! I like Bob the Builder b/c I can just imagine that he'd build me a house! I've never seen fireman Sam myself, but my daughters have watched and like it. My favorite character from hit entertainment is Muck from Bob the builder because she loves to play and get dirty, like me. Thanks for the great giveaway. I've never seen Fireman Sam, but my son loves his Bob the Builder DVD that we won from your site! So I imagine he would love Sam as well. Bob is a favorite over here. We have never heard of Fireman Sam, but now we'll need to check him out! My son LOVES Fireman Sam. I didn't know the DVD's were available in the US market. He saw it somehow I think when we were in Thailand. I sing about "Fireman Jojo, the Hero Next Door" sometimes, based on the theme song. Bob the Builder is our second favorite HIT star. Bob the Builder is our fave here! We even had a Bob birthday party one year. I would have to say Barney. Because we love him,he loves us and he makes us a happy family. rainbow magic :)I have three school age girls. My son loves Thomas the Train! I am sure he would be delighted to have Fireman Sam too! He wants to be a fireman when he grows up! Thanks! I have your button on my sidebar already! Thanks!! I've never heard of Fireman Sam but my oldest does like Bob the Builder, my middle son likes playing with firemen, police men, etc.. so this might be cool for him! Would love to win this - thanks!! !bob the builder - my grandson adores tools and helps his grandaddy!!! Well as we have never seen this before I can't say who our favorite is, but I imagine it would be Sam himself! Bob The Builder is our favorite Hit Entertainment show. I really like the firetruck. Bob, cause all the kids think he's so cool! Bob The Builder is our favorite. Red from Fraggle Rock. Her hair is great and Fraggle Rock reminds me of my childhood. Our favorite Hit Entertainment character is definitely Bob the Builder. I think the theme song might be the first song my son's ever sung on his own! i love thomas the tank engine! Hello, my name is Carolyn and I am a sweepstakes-a-holic....OH! and also a big Bob the Builder fan! My favorite is Bob the Builder because that is my son's favorite. Definitely Bob the Builder...we have a couple of these that are pretty worn out! Scoop it pretty cute & our favorite! My favorite character is Pingu, because I love penguins! Fireman Sam is a favorite of mine...because he is a hero!